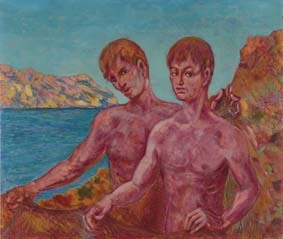 Even though this painting has a mythological flavour and it is very similar to the Dioscuri already seen in the Thirties, its title and the fishing net in the hands of the two men suggest the biblical inspiration, from the Book of Tobias. During a stop on the shores of Tigris, Tobiolo decides to take a bath, but suddenly an enormous fish gets out of the water and threatens to devour him. Raphael encourages Tobiolo not to be scared, but on the contrary he helps him, with his advice, to catch it and he recommends him to keep its heart, venom and liver. Arrived to their destination, Tobiolo withdraws the money and Raphael suggests to make a stop at the house of a relative of the boy, whose daughter, Sara, could have been a perfect bride for him. Got to Sara's house, who was also a Jew and daughter of exiles, Tobiolo finds out that she is possessed by the demon Asmodeus, that has already devoured the previous seven husbands she had had during the first night as married. Adviced by his companion, Tobiolo, despite the great fear, still marries Sara and, following Raphael's suggestions, once alone with the bride in the nuptial room, he burns in an incense burner the heart and the liver of the fish caught during the trip, creating such a terrible smell that Asmodeus is forced to escape to the regions of High Egypt where his hands and feet are put in chains by Angel Raphael himself. On their way back with Sara, the travellers reach Tobias' house where Raphael orders Tobiolo to spread the venom of the fish on his father's eyes and this way he reacquires his sight. In front of so many strange facts Tobias asks Raphael to reveal himself and asks him how could he repay him for everything. To this he replies: " I am Raphael, one of the seven Angels who are always ready to enter the presence of the majesty of the Lord. Now bless the Lord on earth and be thankful to God. I will go back to Him who has sent me." 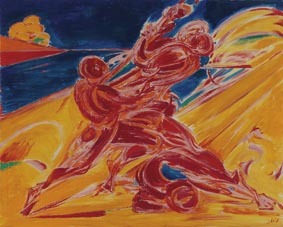 (Tobias 12, 15)"
In 1966-67 Sassu painted that famous work of his, La Terre est bleue comme un orange, suggested by the verses of Paul Eluard. This canvas of the 1970 recalls the style, colours and geometry of that painting, as if it was deepening the details of the previous artwork. Venezuela is a country that often appears in the paintings of Aligi Sassu, it is the scenery for some lithographic works and main subject of many drawings and paintings of the Seventies and the Eighties. To attract him is the nature of Canaima, a national park at the border with Brasil and therefore characterised by the Amazon rainforest and by typically South American natural beauties, as they were never seen and painted by Sassu until then. Salto Angel is the highest fall of the world, and the artist is enchanted by it in its natural monumental essence and by the colours lighted up by the equatorial sun. To these lands Sassu dedicates a chapter of his autobiography, in which he describes his trip in the tropical forest with the friend and climber of the K2, Walter Bonatti. 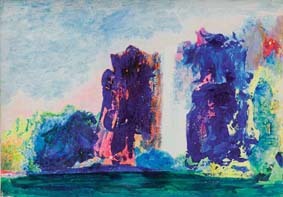 To this, that he defines his "tropical adventure", the artist dedicates some of his poems as well, such as Flying over Auyan Tepuy (the mountain from which the fall of Salto Angel is formed), written on November, 24th 1976: "It is that escaping / that the careful sentinel / on the limits of the sky / confines the shadows to the rocks. / The rio is deep but high / is the bank of the Dorado. / Of clouds, the sky seeds waters / on the antique rocks. / Squared silences of antique ages / raised by weak waves / ride the immensity."